No work by Puccini has suffered more neglect and critical ignorance than Il Trittico, his "triptych" of three single act operas that premiered at the Metropolitan Opera one hundred years ago. Part of what has hurt the reputation of this work- comprised of three operas designed to be performed together and in a certain sequence- is the unfortunate habit producers have of playing these works individually, or pairing them "Cav-Pag" style with operas by other composers. 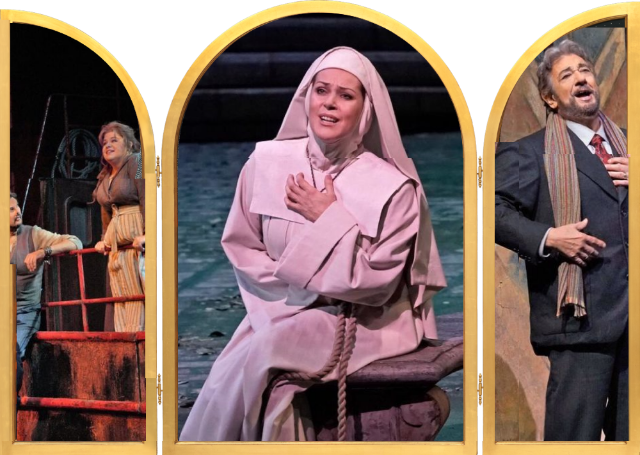 After eleven years away, the Met's handsome production is finally back on the boards, and Monday night's performances of Il Tabarro, Suor Angelica and Gianni Schicchi (in that order, as Puccini intended) shows that this masterpiece is best when done as the composer intended: together. But this welcome revival is not the story here: the story is that the title role in the last of these operas is performed by the indefatigable superstar Placido Domingo in a rare excursion into comic opera. He was helped in his efforts by a talented cast of comedians. Veterans Stephanie Blythe and Maurizio Muraro led the greedy relatives, who go along with Schicchi's scheme under penalty of mutilation and exile. (Puccini, is after all, still Puccini, even when writing comedy.) The lunacy was abetted by Patrick Carfizzi, Tony Stevenson and Kevin Burdette, the last memorable and vocally unrecognizable by the nasal voice he affected for the part of Dr. Spinelloccio. Atalla Ayan and Kristrina Mkhitaryan made an appealing pair of young lovers, with Ayan hitting his notes despite being announced as suffering from a cold. Suor Angelica is the slightest of these three works, the story of a nun who learns that her child (whose birth was the reason she was sent to the convent) has died. Kristine Opolais made the star turn in the title role, singing with power, range and a firm dramatic conviction as she traced this gut-wrenching character arc. Also impressive here was Blythe as the icy Zia Principessa, who shows up at the nunnery to demand Angelica's signature on a key legal document and coldly impart the news of the child's fate. Sensitive conducting from Bertrand de Billy and the skill of the Met's comprimario and choral singers elevated this performance. Il Tabarro is the most verismo piece here: the story of a barge captain on the Seine who discovers his wife's infidelity and (in less than an hour) goes from Joe Schmo to homicidal husband. (He kills her lover and hides the body in the opera's titular cloak.) Giorgio Gagnidze offered a restrained performance as Michele that went off the rails into homicidal menace at the opera's end. Amber Wagner was formidable as his wife Georgette, singing this demanding music with power and a legato line. As the doomed suitor Luigi, Marcelo Álvarez offered a reminder of his past glories, singing this short part with emotion and clarion tone. It was with the opening bars of Il Tabarro that Bertrand de Billy set the tone for the entire evening. His conducting was slow and rich in detail, drawing out Puccini's almost impressionist tone painting of life on the river. This led to the religious ecstasies of Suor Angelica and the pointed humor of Gianni Schicchi. Conductor and orchestra took pains to bring out the details in the score: including the quotations and references back to past Puccini glories. This handsome Jack O'Brien production, with its raked surfaces and a bevy of trompe l'oeil visuals by designer Douglas W. Schmidt, reminds one of a more opulent era at the Met. Maybe that's why it's not revived too often.